Ten inpatient beds are to close at a Devon community hospital on a temporary basis, health bosses say. The move at Axminster Hospital would be offset by eight extra beds at Seaton Hospital, eight miles (12km) away, the Northern Devon Healthcare Trust said. It said the decision was taken because of a poor ratio of nurses to patients and recruitment difficulties. Campaigners handed a petition against the plans with nearly 7,000 signatures to the meeting making the decision. Seaton Hospital will have 18 inpatient beds after the move is implemented. 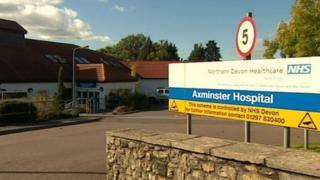 Plans to close Axminster's inpatient unit and merge with Seaton were initially announced in October and later postponed. They were proposed after health inspectors ruled there were not enough nurses for both sites, potentially putting patients at risk. Critics of the proposals said they believed their arguments to protect Axminster and local services had been ignored. Steve Holt, of the Axminster Hospital League of Friends, said he was "extremely disappointed" at the decision. He added: "I can't say that I'm not surprised. I do feel there was a drive to go for the option of Seaton." The trust said it had made the latest decision after having problems recruiting and retaining nurses for both hospitals. Although described as a temporary move, the trust has not confirmed any end date for the arrangement.